Out in the open wear Summer Breeze. Rainy days are Gloshette days : a "G.P." product. Insist on G.P. footwear : made better to wear better. Russell "friendly fit" with steel arch support. Promenade with pride and comfort in G.P. "Dolores" shoes. Iris lingerie : as charming and delicate as the flower. 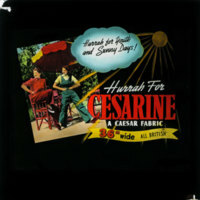 Cesarine (self colours) : guaranteed fadeless, all British. For hours of ease, fashion decrees frocks of Cesarine self colour. Hurrah for youth and sunny days! : hurrah for Cesarine. Summer Breeze : ask to see this lovely new design. Cool, calm and colourful in a frock of Summer Breeze.